I woke up this morning and noticed something amazing – it wasn’t pitch black outside. Spring is coming! Somewhere between fluffy fleeces and new snow boots, the days have started getting longer again. And before you know it, summer will be just around the corner. Marking change, growth and transition is important. Mixbook recognizes this important fact, especially when it comes to our children’s school year. Kids love looking back on where they were, what they knew, what they’ve seen – and most importantly, where they are now. Come June, another academic season will be wrapping up. Mixbook offers some great ideas for your yearbook planning. Shish! Boom! Rah! Show what 2015-2016 looks like when your student body comes together to be a team. Winning the big championship – Dancing under the stars - An art show to raise money for your school charity: Design the pages of a traditional yearbook as nontraditionally as you want. With layouts that focus on the big picture, illustrate what can be accomplished when students inspire one another through collaboration. Celebrate uniqueness. Design your yearbook in a specific, intentional way that fits your community and your community only. Maybe your school unites to celebrate the holidays – create a timeline from September to June with distinctive pages that show the changes of the seasons on your campus. Or perhaps action, excellence and achievement are the focus of your school – design individual pages that recognize accomplishments that students have made. 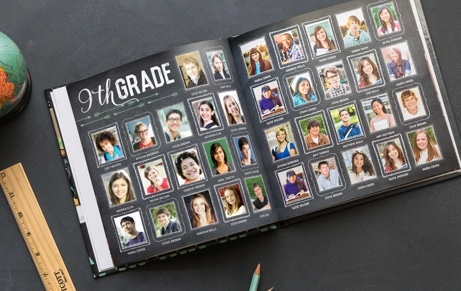 Mixbook offers an array of yearbooks that can be specifically designed to commemorate what matters to your school. Sometimes designing one yearbook for an entire school is not enough. Sometimes you need to slow down and reflect on how much has happened in a single year. The first overnight trip to Washington DC – the science fair that pretty much blew the roof off everyone’s expectations –the funny memories Ms. White has of her poetry class and the limericks people crafted: Mixbook’s yearbooks have layouts that can be adapted to reveal all of these special moments for your class. It’s a way to really be able to look back and remember the year in all of its glory. For those who express themselves in a spoonful of sugar and two dollops of cream, create a look back at the year through the recipes that feed you. Pages that showcase students with their favorite family recipe and what that represents is a really personal way to mark time. Sunday morning making banana pancakes, Monday nights rolling fresh gnocchi, Tuesday afternoons baking Grandma’s famous oatmeal cookies - food is a powerful way we come together to show affection. Whether it’s a group of 4 year olds or a group of teenagers, children look at the world in a provocative way. Noting the ideas and the creativity to connect concepts is a fantastic way to cherish these fleeting moments. That 4 year old will soon realize that digging a hole to China isn’t as easy as it sounds. And maybe that 16 year old will keep thinking about why pie equals 3.14. Capture the questions being asked today to see what they turn into tomorrow. For yearbook savings starting at 45% off, contact our sales team here!